Blog / Events / Florence is Dressing in Blue: 27 Hours of Non-stop Events! 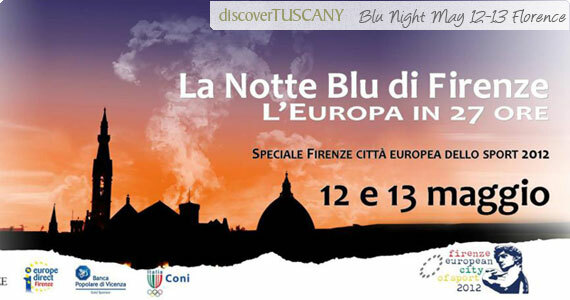 The Blue Night of Florence takes place this upcoming weekend on May 12-13, 2012 and offers a varied program rich in surprises, activities, exhibitions and much more. The Blue Night is a manifestation which lasts 27 hours of non-stop events, most of them dedicated to games and sports as Florence has been declared European City of Sports for 2012. Also known as the Feast of Europe, it celebrates the “Schuman Declaration” which ratified the birth of the European Union on May 9, 1950. For this reason, many of the initiatives are dedicated to the Old World and aim to reinforce the identity, integration and tolerance between people and different cultures in Italy! In the squares you’ll find music, concerts and shows dedicated to dance and to the theater, exhibitions, meetings, debates, and sports everywhere: at the sport centers, on the streets, at the Cascine Park and in the squares many organized activities will be open to the public to try new sports – a special occasion to try less well-known disciplines. The public but kids in particular will be entertained by a series of fun games including chess without frontiers, kites at Piazzale Michelangelo, a workshop for kids and parents about ancient sports and many others. Participate in the Blue Night and celebrate today’s Europe too!